Mouseover thumbnails below to view larger images. Rugged IDAN system configurations available. 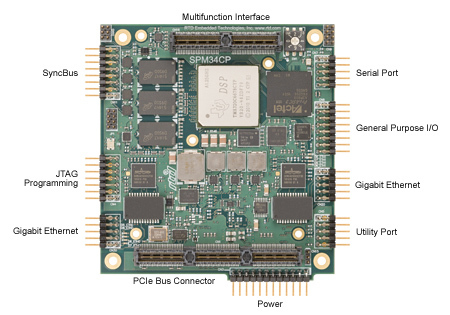 Based on the Texas Instruments TMS320C667x, RTD’s SPM35CP dspModules are versatile fixed/floating point embedded DSP controllers with a PCIe/104 stackable bus structure. The onboard DSP chip supports high-performance signal processing applications such as imaging, test, and automation. Deterministic processing allows the DSP to outperform general purpose processors for time-critical applications. 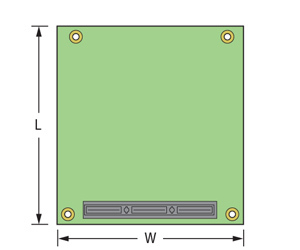 The C6678 platform is power-efficient and easy to use. The C66x CorePac DSP is fully backward compatible with TI’s existing C6000 family of fixed and floating point DSPs. High-speed data connections such as PCI Express, Serial RapidIO®, and Gigabit Ethernet connect the DSP to the outside world. The PCI Express connector permits the DSP to act as a co-processor to a PCIe/104 host cpuModule while 16 Mbyte of onboard flash permits true stand-alone operation of the DSP without a host. A high-speed multifunction interface enables system‑level peer‑to‑peer data transfer. Additional hardware features include one RS-232/422/485 serial port as well as fourteen 5V-tolerant 3VTTL digital I/O. When paired with an RTD cpuModule and a high-speed signal source/drain (e.g. RTD’s DM35418HR dataModule), the result is a complete high-speed data acquisition, signal processing, and decision-making system. The Gigabit Ethernet connections, or stackable Serial RapidIO® (which boasts four configurable lanes), are ideal for high-speed data transfers between the DSP and the mated data acquisition board or system. The SPM35CP is available in dual-core and octal-core configurations and includes a suite of matching host-side and DSP-side libraries permitting single and multi-threaded applications for all on-board features. DSP power consumption is heavily influenced by the running software and system activity. Please refer to the hardware manual for detailed consumption scenarios.